This article is about the canyon in the southwestern United States. For other Grand Canyons, see Grand Canyon (disambiguation). The Grand Canyon (Hopi: Ongtupqa; Yavapai: Wi:kaʼi:la, Navajo: Bidááʼ Haʼaztʼiʼ Tsékooh, Spanish: Gran Cañón) is a steep-sided canyon carved by the Colorado River in Arizona, United States. The Grand Canyon is 277 miles (446 km) long, up to 18 miles (29 km) wide and attains a depth of over a mile (6,093 feet or 1,857 meters). The canyon and adjacent rim are contained within Grand Canyon National Park, the Kaibab National Forest, Grand Canyon-Parashant National Monument, the Hualapai Indian Reservation, the Havasupai Indian Reservation and the Navajo Nation. President Theodore Roosevelt was a major proponent of preservation of the Grand Canyon area, and visited it on numerous occasions to hunt and enjoy the scenery. Nearly two billion years of Earth's geological history have been exposed as the Colorado River and its tributaries cut their channels through layer after layer of rock while the Colorado Plateau was uplifted. While some aspects about the history of incision of the canyon are debated by geologists, several recent studies support the hypothesis that the Colorado River established its course through the area about 5 to 6 million years ago. Since that time, the Colorado River has driven the down-cutting of the tributaries and retreat of the cliffs, simultaneously deepening and widening the canyon. Grand Canyon, Arizona, Nevada, Lake Powell to Lake Mead, June 27, 2017, Sentinel-2 true-color satellite image. Scale 1:450,000. The Grand Canyon is a river valley in the Colorado Plateau that exposes uplifted Proterozoic and Paleozoic strata, and is also one of the six distinct physiographic sections of the Colorado Plateau province. It is not the deepest canyon in the world (Kali Gandaki Gorge in Nepal is much deeper). However, the Grand Canyon is known for its visually overwhelming size and its intricate and colorful landscape. Geologically, it is significant because of the thick sequence of ancient rocks that are well preserved and exposed in the walls of the canyon. These rock layers record much of the early geologic history of the North American continent. Uplift associated with mountain formation later moved these sediments thousands of feet upward and created the Colorado Plateau. The higher elevation has also resulted in greater precipitation in the Colorado River drainage area, but not enough to change the Grand Canyon area from being semi-arid. 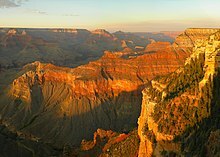 The uplift of the Colorado Plateau is uneven, and the Kaibab Plateau that Grand Canyon bisects is over one thousand feet (300 m) higher at the North Rim (about 1,000 ft or 300 m) than at the South Rim. Almost all runoff from the North Rim (which also gets more rain and snow) flows toward the Grand Canyon, while much of the runoff on the plateau behind the South Rim flows away from the canyon (following the general tilt). The result is deeper and longer tributary washes and canyons on the north side and shorter and steeper side canyons on the south side. Temperatures on the North Rim are generally lower than those on the South Rim because of the greater elevation (averaging 8,000 feet or 2,400 metres above sea level). Heavy rains are common on both rims during the summer months. Access to the North Rim via the primary route leading to the canyon (State Route 67) is limited during the winter season due to road closures. 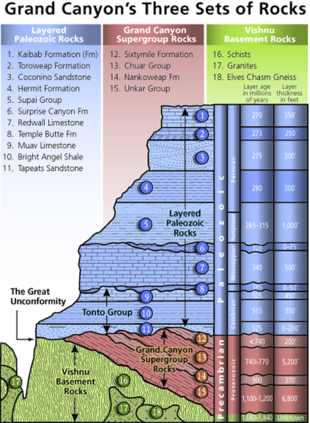 The Grand Canyon is part of the Colorado River basin which has developed over the past 70 million years, in part based on apatite (U-Th)/He thermochronometry showing that Grand Canyon reached a depth near to the modern depth by 20 Ma. A recent study examining caves near Grand Canyon places their origins beginning about 17 million years ago. Previous estimates had placed the age of the canyon at 5–6 million years. The study, which was published in the journal Science in 2008, used uranium-lead dating to analyze calcite deposits found on the walls of nine caves throughout the canyon. There is a substantial amount of controversy because this research suggests such a substantial departure from prior widely supported scientific consensus. In December 2012, a study published in the journal Science claimed new tests had suggested the Grand Canyon could be as old as 70 million years. However, this study has been criticized by those who support the "young canyon" age of around six million years as "[an] attempt to push the interpretation of their new data to their limits without consideration of the whole range of other geologic data sets." The canyon is the result of erosion which exposes one of the most complete geologic columns on the planet. The major geologic exposures in the Grand Canyon range in age from the 2-billion-year-old Vishnu Schist at the bottom of the Inner Gorge to the 230-million-year-old Kaibab Limestone on the Rim. There is a gap of about a billion years between the 500-million-year-old stratum and the level below it, which dates to about 1.5 billion years ago. This large unconformity indicates a long period for which no deposits are present. Many of the formations were deposited in warm shallow seas, near-shore environments (such as beaches), and swamps as the seashore repeatedly advanced and retreated over the edge of a proto-North America. Major exceptions include the Permian Coconino Sandstone, which contains abundant geological evidence of aeolian sand dune deposition. Several parts of the Supai Group also were deposited in non–marine environments. The great depth of the Grand Canyon and especially the height of its strata (most of which formed below sea level) can be attributed to 5–10 thousand feet (1,500 to 3,000 m) of uplift of the Colorado Plateau, starting about 65 million years ago (during the Laramide Orogeny). This uplift has steepened the stream gradient of the Colorado River and its tributaries, which in turn has increased their speed and thus their ability to cut through rock (see the elevation summary of the Colorado River for present conditions). Weather conditions during the ice ages also increased the amount of water in the Colorado River drainage system. The ancestral Colorado River responded by cutting its channel faster and deeper. The base level and course of the Colorado River (or its ancestral equivalent) changed 5.3 million years ago when the Gulf of California opened and lowered the river's base level (its lowest point). This increased the rate of erosion and cut nearly all of the Grand Canyon's current depth by 1.2 million years ago. The terraced walls of the canyon were created by differential erosion. Between 100,000 and 3 million years ago, volcanic activity deposited ash and lava over the area which at times completely obstructed the river. These volcanic rocks are the youngest in the canyon. Eagle Rock (located at Eagle Point) on the West Rim, named for its shape, is considered sacred by the Hualapai Indians. Archaeologists still debate when this distinct culture emerged. The current consensus, based on terminology defined by the Pecos Classification, suggests their emergence was around 1200 BCE during the Basketmaker II Era. Beginning with the earliest explorations and excavations, researchers have believed that the Ancient Puebloans[clarify] are ancestors of the modern Pueblo peoples. In addition to the Ancestral Puebloans, a number of distinct cultures have inhabited the Grand Canyon area. The Cohonina lived to the west of the Grand Canyon, between 500 and 1200 CE. The Cohonina were ancestors of the Yuman, Havasupai, and Hualapai peoples who inhabit the area today. 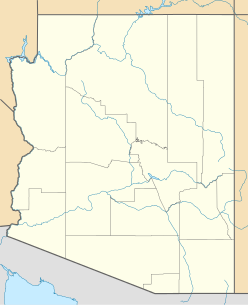 The Sinagua were a cultural group occupying an area to the southeast of the Grand Canyon, between the Little Colorado River and the Salt River, between approximately 500 and 1425 CE. The Sinagua may have been ancestors of several Hopi clans. By the time of the arrival of Europeans in the 16th century, newer cultures had evolved. The Hualapai inhabit a 100-mile (160 km) stretch along the pine-clad southern side of the Grand Canyon. The Havasupai have been living in the area near Cataract Canyon since the beginning of the 13th century, occupying an area the size of Delaware. The Southern Paiutes live in what is now southern Utah and northern Arizona. The Navajo, or Diné, live in a wide area stretching from the San Francisco Peaks eastwards towards the Four Corners. Archaeological and linguistic evidence suggests the Navajo descended from the Athabaskan people near Great Slave Lake, Canada, who migrated after the 11th century. In September 1540, under orders from the conquistador Francisco Vázquez de Coronado to search for the fabled Seven Cities of Cibola, Captain García López de Cárdenas, along with Hopi guides and a small group of Spanish soldiers, traveled to the south rim of the Grand Canyon between Desert View and Moran Point. Pablo de Melgrossa, Juan Galeras, and a third soldier descended some one third of the way into the canyon until they were forced to return because of lack of water. In their report, they noted that some of the rocks in the canyon were "bigger than the great tower of Seville, Giralda " It is speculated that their Hopi guides likely knew routes to the canyon floor, but may have been reluctant to lead the Spanish to the river. No Europeans visited the canyon again for more than two hundred years. Fathers Francisco Atanasio Domínguez and Silvestre Vélez de Escalante were two Spanish priests who, with a group of Spanish soldiers, explored southern Utah and traveled along the north rim of the canyon in Glen and Marble Canyons in search of a route from Santa Fe to California in 1776. They eventually found a crossing, formerly known as the "Crossing of the Fathers," that today lies under Lake Powell. Also in 1776, Fray Francisco Garces, a Franciscan missionary, spent a week near Havasupai, unsuccessfully attempting to convert a band of Native Americans to Christianity. He described the canyon as "profound". James Ohio Pattie, along with a group of American trappers and mountain men, may have been the next European to reach the canyon, in 1826. Jacob Hamblin, a Mormon missionary, was sent by Brigham Young in the 1850s to locate suitable river crossing sites in the canyon. Building good relations with local Hualapai and white settlers, he found the Crossing of the Fathers, and the locations that would become Lees Ferry in 1858 and Pearce Ferry (later operated by, and named for, Harrison Pearce) – only the latter two sites suitable for ferry operation. He also acted as an advisor to John Wesley Powell before his second expedition to the Grand Canyon, serving as a diplomat between Powell and the local native tribes to ensure the safety of his party. In 1857, Edward Fitzgerald Beale was superintendent of an expedition to survey a wagon road along the 35th parallel from Fort Defiance, Arizona to the Colorado River. He led a small party of men in search of water on the Coconino Plateau near the canyon's south rim. On September 19, near present-day National Canyon, they came upon what May Humphreys Stacey described in his journal as "...a wonderful canyon four thousand feet deep. Everyone (in the party) admitted that he never before saw anything to match or equal this astonishing natural curiosity." Also in 1857, the U.S. War Department asked Lieutenant Joseph Ives to lead an expedition to assess the feasibility of an up-river navigation from the Gulf of California. Also in a stern wheeler steamboat Explorer, after two months and 350 miles (560 km) of difficult navigation, his party reached Black Canyon some two months after George Johnson. The Explorer struck a rock and was abandoned. Ives led his party east into the canyon — they may have been the first Europeans to travel the Diamond Creek drainage and traveled eastwards along the south rim. In his "Colorado River of the West" report to the Senate in 1861 he states that "One or two trappers profess to have seen the canyon." According to the San Francisco Herald, in a series of articles run in 1853, Captain Joseph R. Walker in January 1851 with his nephew James T. Walker and six men, traveled up the Colorado River to a point where it joined the Virgin River and continued east into Arizona, traveling along the Grand Canyon and making short exploratory side trips along the way. Walker is reported to have said he wanted to visit the Moqui Indians, as the Hopi were then called by whites. He had met these people briefly in previous years, thought them exceptionally interesting and wanted to become better acquainted. The Herald reporter then stated, "We believe that Captain Joe Walker is the only white man in this country that has ever visited this strange people." In 1858, John Strong Newberry became probably the first geologist to visit the Grand Canyon. In 1869, Major John Wesley Powell led the first expedition down the canyon. Powell set out to explore the Colorado River and the Grand Canyon. Powell ordered a shipwright to build four reinforced Whitewall rowboats from Chicago and had them shipped east on the newly completed Continental railroad. He hired nine men, including his brother Walter, and collected provisions for ten months. They set out from Green River, Wyoming on May 24. Passing through (or portaging around) a series of dangerous rapids, the group passed down the Green River to its confluence with the Colorado River, near present-day Moab, Utah. Most of their food spoiled after getting wet in the waves or by heavy rains. Beaten up by ferocious whitewater and nearly out of food, three men left the expedition in the Grand Canyon, electing to walk 75 miles out across a desert to a Mormon settlement. Never seen again, their disappearance remains one of the most enduring mysteries of American western history. The remaining members completed the journey through the Grand Canyon on August 13, 1869. In 1871 Powell first used the term "Grand Canyon"; previously it had been called the "Big Canyon". In 1889, Frank M. Brown wanted to build a railroad along the Colorado River to carry coal. He, his chief engineer Robert Brewster Stanton, and 14 others started to explore the Grand Canyon in poorly designed cedar wood boats, with no life preservers. 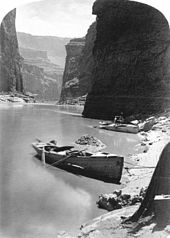 Brown drowned in an accident near Marble Canyon: Stanton made new boats and proceeded to explore the Colorado all of the way to the Gulf of California. The Grand Canyon became an official national monument in 1908 and a national park in 1919. U.S. President Theodore Roosevelt visited the Grand Canyon in 1903. An avid outdoorsman and staunch conservationist, Roosevelt established the Grand Canyon Game Preserve on November 28, 1906. Livestock grazing was reduced, but predators such as mountain lions, eagles, and wolves were eradicated. Roosevelt along with other members of his conservation group, the Boone and Crockett Club helped form the National Parks Association, which in turn lobbied for the Antiquities Act of 1906 which gave Roosevelt the power to create national monuments. Once the act was passed, Roosevelt immediately added adjacent national forest lands and redesignated the preserve a U.S. National Monument on January 11, 1908. Opponents such as land and mining claim holders blocked efforts to reclassify the monument as a U.S. National Park for 11 years. Grand Canyon National Park was finally established as the 17th U.S. National Park by an Act of Congress signed into law by President Woodrow Wilson on February 26, 1919. The federal government administrators who manage park resources face many challenges. These include issues related to the recent reintroduction into the wild of the highly endangered California condor, air tour overflight noise levels, water rights disputes with various tribal reservations that border the park, and forest fire management. Federal officials started a flood in the Grand Canyon in hopes of restoring its ecosystem on March 5, 2008. The canyon's ecosystem was permanently changed after the construction of the Glen Canyon Dam in 1963. Between 2003 and 2011, 2,215 mining claims had been requested that are adjacent to the canyon, including claims for uranium mines. Mining has been suspended since 2009, when U.S. Interior Secretary Ken Salazar withdrew 1 million acres (4,000 km2) from the permitting process, pending assessment of the environmental impact of mining. Critics of the mines are concerned that, once mined, the uranium will leach into the water of the Colorado River and contaminate the water supply for up to 18 million people. Salazar's so-called "Northern Arizona Withdrawal" is a 20-year moratorium on new mines, but allows existing mines to continue. In 2012, the federal government stopped new mines in the area, which was upheld by the U.S. District Court for Arizona in 2014, but appealed by the National Mining Association, joined by the state of Arizona under Attorney General Mark Brnovich as well as Utah, Montana and Nevada. National Mining Association v. Jewell is pending before the Ninth Circuit Court of Appeals as of September 2015. There are several historic buildings located along the South Rim with most in the vicinity of Grand Canyon Village. Buckey O'Neill Cabin was built during the 1890s by William Owen "Buckey" O'Neill. He built the cabin because of a copper deposit that was nearby. He had several occupations such as miner, judge, politician, author and tour guide. This cabin is the longest continually standing structure on the South Rim. It is currently used as a guest house; booking is required well in advance. Kolb Studio was built in 1904 by brothers Ellsworth and Emery Kolb. They were photographers who made a living by photographing visitors walking down the Bright Angel Trail. In 1911, the Kolb brothers filmed their journey down the Green and Colorado Rivers. Emery Kolb showed this movie regularly in his studio until 1976, when he died at the age of 95. Today the building serves as an art gallery and exhibit. The El Tovar Hotel was built in 1905 and is the most luxurious lodging on the South Rim. The hotel consists of 4 stories with a rustic chalet appearance called "National Park Rustic." It was designed by Charles Whittlesley. A gift shop and restaurant are located inside the hotel. Hopi House was built by Mary Jane Colter in 1905. It is based on structures that were built in an ancient Hopi settlement called Old Oraibi, located on the Third Mesa in eastern Arizona. It served as a residence for the Hopi Indians who sold arts and crafts to South Rim visitors. Verkamp's Curios, which stands next to the Hopi House, was built by John Verkamp in 1905. He sold arts and crafts as well as souvenirs. Until September 2008, it was run by his descendants; in November 2008, the building reopened as a visitor center focusing on the history of the Grand Canyon Village community. Grand Canyon Railway Depot was completed in 1910 and contains 2 levels. Gordon Chappell, Regional Historian for the Park Service, claims that this depot building is one of only three log-cabin-style train stations currently standing, out of fourteen ever built in the U.S. The depot is the northern terminus of the Grand Canyon Railway which begins in Williams, Arizona. Lookout Studio, another Mary Colter design, was built in 1914. Photography, artwork, books, souvenirs, and rock and fossil specimens are sold here. A great view of Bright Angel Trail can be seen here. Desert View Watchtower, one of Mary Colter's best-known works, was built in 1932. Situated at the far eastern end of the South Rim, 27 miles (43 km) from Grand Canyon Village, the tower stands 70 feet (21 m) tall. 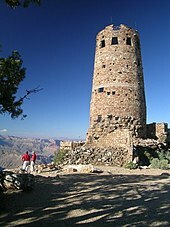 The top of the tower is 7,522 feet (2,293 m) above sea level, the highest point on the South Rim. It offers one of the few full views of the bottom of the canyon and the Colorado River. It was designed to mimic Ancestral Puebloans watchtowers, though, with four levels, it is significantly taller than historical towers. Bright Angel Lodge was built of logs and stone in 1935. Mary Colter designed the lodge and it was built by the Fred Harvey Company. Inside the lodge is a small museum honoring Fred Harvey (June 27, 1835 – February 9, 1901), who played a major role in popularizing the Grand Canyon. In the History Room is a stone fireplace layered in the same sequence as those in the canyon. Weather in the Grand Canyon varies according to elevation. The forested rims are high enough to receive winter snowfall, but along the Colorado River in the Inner Gorge, temperatures are similar to those found in Tucson and other low elevation desert locations in Arizona. Conditions in the Grand Canyon region are generally dry, but substantial precipitation occurs twice annually, during seasonal pattern shifts in winter (when Pacific storms usually deliver widespread, moderate rain and high-elevation snow to the region from the west) and in late summer (due to the North American Monsoon, which delivers waves of moisture from the southeast, causing dramatic, localized thunderstorms fueled by the heat of the day). Average annual precipitation on the South Rim is less than 16 inches (41 cm), with 60 inches (150 cm) of snow; the higher North Rim usually receives 27 inches (69 cm) of moisture, with a typical snowfall of 144 inches (370 cm); and Phantom Ranch, far below the canyon's rims along the Colorado River at 2,500 feet (762 m) gets just 8 inches (20 cm) of rain, and snow is a rarity. Temperatures vary wildly throughout the year, with summer highs within the Inner Gorge commonly exceeding 100 °F (37.8 °C) and winter minimum temperatures sometimes falling below zero degrees Fahrenheit (−17.8 °C) along the canyon's rims. Visitors are often surprised by these potentially extreme conditions, and this, along with the high altitude of the canyon's rims, can lead to unpleasant side effects such as dehydration, sunburn, and hypothermia. Weather conditions can greatly affect hiking and canyon exploration, and visitors should obtain accurate forecasts because of hazards posed by exposure to extreme temperatures, winter storms and late summer monsoons. While the park service posts weather information at gates and visitor centers, this is a rough approximation only, and should not be relied upon for trip planning. For accurate weather in the canyon, hikers should consult the National Weather Service's NOAA weather radio or the official National Weather Service website. The National Weather Service has had a cooperative station on the South Rim since 1903. The record high temperature on the South Rim was 105 °F (41 °C) on June 26, 1974, and the record low temperature was −20 °F (−29 °C) on January 1, 1919, February 1, 1985, and December 23, 1990. The Grand Canyon area has some of the cleanest air in the United States. :p.5-2  However, at times the air quality can be considerably affected by events such as forest fires and dust storms in the Southwest. There are approximately 1,737 known species of vascular plants, 167 species of fungi, 64 species of moss and 195 species of lichen found in Grand Canyon National Park. This variety is largely due to the 8,000 foot (2,400 m) elevation change from the Colorado River up to the highest point on the North Rim. Grand Canyon boasts a dozen endemic plants (known only within the Park's boundaries) while only ten percent of the Park's flora is exotic. Sixty-three plants found here have been given special status by the U.S. Fish and Wildlife Service. The Mojave Desert influences the western sections of the canyon, Sonoran Desert vegetation covers the eastern sections, and ponderosa and pinyon pine forests grow on both rims. Natural seeps and springs percolating out of the canyon walls are home to 11% of all the plant species found in the Grand Canyon. The canyon itself can act as a connection between the east and the west by providing corridors of appropriate habitat along its length. The canyon can also be a genetic barrier to some species, like the tassel-eared squirrel. The aspect, or direction a slope faces, also plays a major role in adding diversity to the Grand Canyon. North-facing slopes receive about one-third the normal amount of sunlight, so plants growing there are similar to plants found at higher elevations, or in more northern latitudes. The south-facing slopes receive the full amount of sunlight and are covered in vegetation typical of the Sonoran Desert. Of the 90 mammal species found along the Colorado River corridor, 18 are rodents and 22 are bats. The Park contains several major ecosystems. Its great biological diversity can be attributed to the presence of five of the seven life zones and three of the four desert types in North America. The five life zones represented are the Lower Sonoran, Upper Sonoran, Transition, Canadian, and Hudsonian. This is equivalent to traveling from Mexico to Canada. Differences in elevation and the resulting variations in climate are the major factors that form the various life zones and communities in and around the canyon. Grand Canyon National Park contains 129 vegetation communities, and the composition and distribution of plant species is influenced by climate, geomorphology and geology. The Lower Sonoran life zone spans from the Colorado River up to 3,500 feet (1,100 m). Along the Colorado River and its perennial tributaries, a riparian community exists. Coyote willow, arrowweed, seep-willow, western honey mesquite, catclaw acacia, and exotic tamarisk (saltcedar) are the predominant species. Hanging gardens, seeps and springs often contain rare plants such as the white-flowering western redbud, stream orchid, and Flaveria mcdougallii. Endangered fish in the river include the humpback chub and the razorback sucker. The three most common amphibians in these riparian communities are the canyon tree frog, red-spotted toad, and Woodhouse's Rocky Mountain toad. Leopard frogs are very rare in the Colorado River corridor, they have undergone major declines and have not been seen in the Canyon in several years. There are 33 crustacean species found in the Colorado River and its tributaries within Grand Canyon National Park. Of these 33, 16 are considered true zooplankton organisms. Only 48 bird species regularly nest along the river, while others use the river as a migration corridor or as overwintering habitat. The bald eagle is one species that uses the river corridor as winter habitat. River otters may have disappeared from the park in the late 20th century, and muskrats are extremely rare. Beavers cut willows, cottonwoods, and shrubs for food, and can significantly affect the riparian vegetation. Other rodents, such as antelope squirrels and pocket mice, are mostly omnivorous, using many different vegetation types. Grand Canyon bats typically roost in desert uplands, but forage on the abundance of insects along the river and its tributaries. In addition to bats, coyotes, ringtails, and spotted skunks are the most numerous riparian predators and prey on invertebrates, rodents, and reptiles. Raccoons, weasels, bobcats, gray foxes, and mountain lions are also present, but are much more rare. Mule deer and desert bighorn sheep are the ungulates that frequent the river corridor. Since the removal of 500 feral burros in the early 1980s, bighorn sheep numbers have rebounded. Mule deer are generally not permanent residents along the river, but travel down from the rim when food and water resources there become scarce. The insect species commonly found in the river corridor and tributaries are midges, caddis flies, mayflies, stoneflies, black flies, mites, beetles, butterflies, moths, and fire ants. Numerous species of spiders and several species of scorpions including the bark scorpion and the giant desert hairy scorpion inhabit the riparian zone. Eleven aquatic and 26 terrestrial species of mollusks have been identified in and around Grand Canyon National Park. Of the aquatic species, two are bivalves (clams) and nine are gastropods (snails). Twenty-six species of terrestrial gastropods have been identified, primarily land snails and slugs. There are approximately 41 reptile species in Grand Canyon National Park. Ten are considered common along the river corridor and include lizards and snakes. Lizard density tends to be highest along the stretch of land between the water's edge and the beginning of the upland desert community. The two largest lizards in the canyon are gila monsters and chuckwallas. Many snake species, which are not directly dependent on surface water, may be found both within the inner gorge and the Colorado River corridor. Six rattlesnake species have been recorded in the park. Above the river corridor a desert scrub community, composed of North American desert flora, thrives. Typical warm desert species such as creosote bush, white bursage, brittlebush, catclaw acacia, ocotillo, mariola, western honey mesquite, four-wing saltbush, big sagebrush, blackbrush and rubber rabbitbrush grow in this community. The mammalian fauna in the woodland scrub community consists of 50 species, mostly rodents and bats. Three of the five Park woodrat species live in the desert scrub community. Except for the western (desert) banded gecko, which seems to be distributed only near water along the Colorado River, all of the reptiles found near the river also appear in the uplands, but in lower densities. The desert gopher tortoise, a threatened species, inhabits the desert scrublands in the western end of the park. Some of the common insects found at elevations above 2,000 feet (610 m) are orange paper wasps, honey bees, black flies, tarantula hawks, stink bugs, beetles, black ants, and monarch and swallowtail butterflies. Solifugids, wood spiders, garden spiders, black widow spiders and tarantulas can be found in the desert scrub and higher elevations. A California condor in flight, photographed from Navajo Bridge at Marble Canyon, 2008. Wild condors are numbered to aid wildlife researchers. As of April 2009, there were 172 wild California condors known. The Upper Sonoran Life Zone includes most of the inner canyon and South Rim at elevations from 3,500 to 7,000 feet (1,100 to 2,100 m). This zone is generally dominated by blackbrush, sagebrush, and pinyon-juniper woodlands. Elevations of 3,500 to 4,000 feet (1,100 to 1,200 m) are in the Mojave Desert Scrub community of the Upper Sonoran. This community is dominated by the four-winged saltbush and creosote bush; other important plants include Utah agave, narrowleaf mesquite, ratany, catclaw acacia, and various cacti species. Approximately 30 bird species breed primarily in the desert uplands and cliffs of the inner canyon. Virtually all bird species present breed in other suitable habitats throughout the Sonoran and Mohave deserts. The abundance of bats, swifts, and riparian birds provides ample food for peregrines, and suitable eyrie sites are plentiful along the steep canyon walls. Also, several critically endangered California condors that were re-introduced to the Colorado Plateau on the Arizona Strip, have made the eastern part of the Park their home. The conifer forests provide habitat for 52 mammal species. Porcupines, shrews, red squirrels, tassel eared Kaibab and Abert's squirrels, black bear, mule deer, and elk are found at the park's higher elevations on the Kaibab Plateau. Above the desert scrub and up to 6,200 feet (1,900 m) is a pinyon pine forest and one seed juniper woodland. Within this woodland one can find big sagebrush, snakeweed, Mormon tea, Utah agave, banana and narrowleaf Yucca, winterfat, Indian ricegrass, dropseed, and needlegrass. There are a variety of snakes and lizards here, but one species of reptile, the mountain short-horned lizard, is a particularly abundant inhabitant of the piñon-juniper and ponderosa pine forests. Ponderosa pine forests grow at elevations between 6,500 and 8,200 feet (2,000 and 2,500 m), on both North and South rims in the Transition life zone. The South Rim includes species such as gray fox, mule deer, bighorn sheep, rock squirrels, pinyon pine and Utah juniper. Additional species such as Gambel oak, New Mexico locust, mountain mahogany, elderberry, creeping mahonia, and fescue have been identified in these forests. The Utah tiger salamander and the Great Basin spadefoot toad are two amphibians that are common in the rim forests. Of the approximately 90 bird species that breed in the coniferous forests, 51 are summer residents and at least 15 of these are known to be neotropical migrants. Elevations of 8,200 to 9,000 feet (2,500 to 2,700 m) are in the Canadian Life Zone, which includes the North Rim and the Kaibab Plateau. Spruce-fir forests characterized by Engelmann spruce, blue spruce, Douglas fir, white fir, aspen, and mountain ash, along with several species of perennial grasses, groundsels, yarrow, cinquefoil, lupines, sedges, and asters, grow in this sub-alpine climate. Mountain lions, Kaibab squirrels, and northern goshawks are found here. Montane meadows and subalpine grassland communities of the Hudsonian life zone are rare and located only on the North Rim. Both are typified by many grass species. Some of these grasses include blue and black grama, big galleta, Indian ricegrass and three-awns. The wettest areas support sedges and forbs. Grand Canyon National Park is one of the world's premier natural attractions, attracting about five million visitors per year. Overall, 83% were from the United States: California (12%), Arizona (9%), Texas (5%), Florida (3%) and New York (3%) represented the top domestic visitors. Seventeen percent of visitors were from outside the United States; the most prominently represented nations were the United Kingdom (4%), Canada (4%), Japan (2%), Germany (2%) and The Netherlands (1%). The South Rim is open all year round weather permitting. The North Rim is generally open mid-May to mid-October. Aside from casual sightseeing from the South Rim (averaging 7,000 feet [2,100 m] above sea level), rafting, hiking, running, and helicopter tours are popular. The Grand Canyon Ultra Marathon is a 78-mile (126 km) race over 24 hours. The floor of the valley is accessible by foot, muleback, or by boat or raft from upriver. Hiking down to the river and back up to the rim in one day is discouraged by park officials because of the distance, steep and rocky trails, change in elevation, and danger of heat exhaustion from the much higher temperatures at the bottom. Rescues are required annually of unsuccessful rim-to-river-to-rim travelers. Nevertheless, hundreds of fit and experienced hikers complete the trip every year. Camping on the North and South rims is generally restricted to established campgrounds and reservations are highly recommended, especially at the busier South Rim. There is at large camping available along many parts of the North Rim managed by Kaibab National Forest. North Rim campsites are only open seasonally due to road closures from weather and winter snowpack. All overnight camping below the rim requires a backcountry permit from the Backcountry Office (BCO). Each year Grand Canyon National Park receives approximately 30,000 requests for backcountry permits. The park issues 13,000 permits, and close to 40,000 people camp overnight. The earliest a permit application is accepted is the first of the month, four months before the proposed start month. Tourists wishing for a more vertical perspective can go skydiving, board helicopters and small airplanes in Boulder, Las Vegas, Phoenix and Grand Canyon National Park Airport (seven miles from the South Rim) for canyon flyovers. Scenic flights are no longer allowed to fly within 1500 feet of the rim within the national park because of a late 1990s crash. 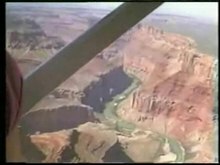 The last aerial video footage from below the rim was filmed in 1984. However, some helicopter flights land on the Havasupai and Hualapai Indian Reservations within Grand Canyon (outside of the park boundaries). In 2007, the Hualapai Tribe opened the glass-bottomed Grand Canyon Skywalk on their property, Grand Canyon West. The Skywalk is about 250 miles (400 km) by road from Grand Canyon Village at the South Rim. The skywalk has attracted "thousands of visitors a year, most from Las Vegas". In 2016, skydiving at the Grand Canyon become possible with the first Grand Canyon Skydiving operation opening up at the Grand Canyon National Park Airport, on the South Rim. In 2014, a developer announced plans to build a multimedia complex on the canyon's rim called the Grand Canyon Escalade. On 420 acres there would be shops, an IMAX theater, hotels and an RV park. A gondola would enable easy visits to the canyon floor where a "riverwalk" of "connected walkways, an eatery, a tramway station, a seating area and a wastewater package plant" would be situated. Navajo Nation President Ben Shelly has indicated agreement; the tribe would have to invest $65 million for road, water and communication facilities for the $1 billion complex. One of the developers is Navajo and has cited an 8 to 18 percent share of the gross revenue for the tribe as an incentive. Lipan Point is a promontory located on the South Rim. This point is located to the east of the Grand Canyon Village along the Desert View Drive. There is a parking lot for visitors who care to drive along with the canyon's bus service that routinely stops at the point. The trailhead to the Tanner Trail is located just before the parking lot. The view from Lipan Point shows a wide array of rock strata and the Unkar Creek area in the inner canyon. About 770 deaths have occurred between the mid 1800s and 2015. Of the fatalities that occurred from 1869 to 2001, some were as follows: 53 resulted from falls; 65 were attributable to environmental causes, including heat stroke, cardiac arrest, dehydration, and hypothermia; 7 were caught in flash floods; 79 were drowned in the Colorado River; 242 perished in airplane and helicopter crashes (128 of them in the 1956 disaster mentioned below); 25 died in freak errors and accidents, including lightning strikes and rock falls; and 23 were the victims of homicides. In 1956, the Grand Canyon was the site of the deadliest commercial aviation disaster in history at the time. On the morning of June 30, 1956, a TWA Lockheed Super Constellation and a United Airlines Douglas DC-7 departed Los Angeles International Airport within three minutes of one another on eastbound transcontinental flights. Approximately 90 minutes later, the two propeller-driven airliners collided above the canyon while both were flying in unmonitored airspace. 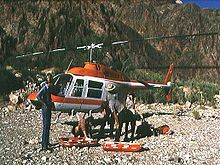 The wreckage of both planes fell into the eastern portion of the canyon, on Temple and Chuar Buttes, near the confluence of the Colorado and Little Colorado rivers. The disaster killed all 128 passengers and crew members aboard both planes. This accident led to the institution of high-altitude airways and direct radar observation of aircraft (known as positive control) by en route ground controllers. ^ a b Karlstrom, Karl E.; Lee, John P.; Kelley, Shari A.; Crow, Ryan S.; et al. (2014). "Formation of the Grand Canyon 5 to 6 million years ago through integration of older palaeocanyons". Nature Geoscience. 7 (3): 239–244. Bibcode:2014NatGe...7..239K. doi:10.1038/ngeo2065. ^ "Pueblos join forces to oppose Grand Canyon Escalade Project". Navajo Times. September 11, 2014. Archived from the original on June 1, 2016. Retrieved April 20, 2016. ^ Linford, Laurence D. Navajo Places. History, Legend, Landscape. University of Utah Press. Salt Lake City, UT: 2000. ^ Wilson, Alan with Gene Dennison. Navajo Place Names. An observer's guide. Jeffrey Norton Publishers. Guilford, CT: 1995. ^ Kiver, E.P. ; Harris, D.V. (1999). Geology of US Parklands. Wiley. p. 902. ^ Ranney, Wayne (2005). Carving Grand Canyon: Evidence, Theories, and Mystery. Grand Canyon Association. ISBN 978-0-938216-82-7. ^ Darling, Andrew; Whipple, Kelin (2015). "Geomorphic constraints on the age of the western Grand Canyon". Geosphere. 11 (4): 958–976. Bibcode:2015Geosp..11..958D. doi:10.1130/ges01131.1. ^ Spencer, J.E. ; Patchett, P.J. ; Pearthree, P.A. ; House, P.K. ; Sarna-Wojcicki, A.M.; Wan, E.; Roskowski, J.A. ; Faulds, J.E. (2013). "Review and analysis of the age and origin of the Pliocene Bouse Formation, lower Colorado River Valley, southwestern USA". Geosphere. 9 (3): 444–459. Bibcode:2013Geosp...9..444S. doi:10.1130/ges00896.1. ^ Mitchell, Douglas R.; Lippert, Dorothy; Brunson-Hadley, Judy L. (2004). Ancient Burial Practices in the American Southwest (reprint, illustrated ed.). Albuquerque, NM: UNM Press. p. 11. ISBN 978-0-8263-3461-9. Archived from the original on May 17, 2016. ^ "History of the Colorado Plateau". Utah History Encyclopedia. Archived from the original on January 9, 2013. Retrieved October 22, 2010. ^ Marlatt, William; Riehl, Herbert (December 15, 1963). "Precipitation regimes over the upper Colorado River". Journal of Geophysical Research. 68 (24): 6447–6458. doi:10.1029/JZ068i024p06447. ^ a b c d This article incorporates public domain material from the National Park Service document "Grand Canyon National Park — Nature and Science". ^ "Winter on the North Rim (off-season)". Operating Hours & Seasons. National Park Service; US Dept. of Interior. Archived from the original on March 3, 2011. Retrieved January 21, 2013. ^ Wernicke, Brian (2011). "The California River and its role in carving Grand Canyon" (PDF). Geological Society of America Bulletin. 123 (7–8): 1288–1316. Bibcode:2011GSAB..123.1288W. doi:10.1130/b30274.1. ^ Flowers, RM (2008). "Unroofing, incision, and uplift history of the southwestern Colorado Plateau from apatite (U-Th)/He thermochronometry". Geological Society of America Bulletin. 120 (May/June): 571–587. Bibcode:2008GSAB..120..571F. doi:10.1130/b26231.1. ^ a b Wilford, John Noble (November 29, 2012). "60-Million-Year Debate on Grand Canyon's Age". New York Times. Archived from the original on January 21, 2013. Retrieved January 22, 2013. ^ Wilford, John (February 6, 2008). "Study Says Grand Canyon Older Than Thought". New York Times. Archived from the original on May 17, 2013. Retrieved February 6, 2008. ^ "How Old is the Grand Canyon?". Science Friday. March 7, 2008. Archived from the original on June 7, 2008. ^ "Grand Canyon as old as the dinosaurs?". 3 News NZ. December 3, 2012. Archived from the original on October 31, 2013. ^ Leveson, David. "The Hypothesis of Differential Erosion". Archived from the original on June 22, 2011. Retrieved October 22, 2010. ^ a b "Getting Started". The Ancestral Puebloans. Hewit Institute, University of Northern Colorado. Archived from the original on July 9, 2010. Retrieved October 22, 2010. ^ a b Tufts, Lorraine Salem (1998). Secrets in The Grand Canyon, Zion and Bryce Canyon National Parks (Third ed.). North Palm Beach, Florida: National Photographic Collections. pp. 12–13. ISBN 978-0-9620255-3-2. ^ "Kaibab National Forest". USDA Forest Service. Archived from the original on February 10, 2009. Retrieved January 4, 2007. ^ McGregor, John Charles (1951). The Cohonina culture of northwestern Arizona. University of Illinois Press. pp. 1–7. ^ Whiting, A.F. (1985). Havasupai Habitat. Tucson, Arizona: University of Arizona Press. 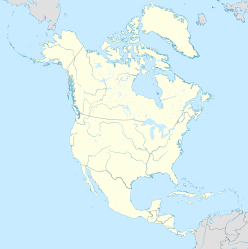 ^ "Discovery of the Athabascan Origin of the Apache and Navajo Language". Watkins, Thayer – San Jose State University. Archived from the original on November 12, 2014. Retrieved July 30, 2014. ^ a b Stegner, Page (1994). Grand Canyon, The Great Abyss. HarperCollins. p. 25. ISBN 978-0-06-258564-6. ^ Hill, Joseph J. (1923). "New light on Pattie and the southwestern fur trade". Southwestern Historical Quarterly. 26 (4). Archived from the original on January 2, 2016. ^ Chorley, Richard J. Geomorphology before Davis. Methuen. ^ Ross, John F. (2018). The Promise of the Grand Canyon. Viking. Retrieved April 19, 2019. ^ "The Beginnings of the U.S. Geological Survey". National Atlas of the United States. 2010. Archived from the original on October 24, 2012. Retrieved November 7, 2010. ^ "Late Arrivals". The Geologic Story of Colorado National Monument. United States Geological Survey. Geological Survey Bulletin 1508. Archived from the original on October 24, 2012. Retrieved November 7, 2010. ^ "Grand Canyon Facts". National Geographic Visitor Center, Arizona. Archived from the original on February 19, 2016. ^ Sheldon, Charles. "History of the Boone and Crockett Club". University of Montana Mansfield Library. Boone and Crockett Club. Archived from the original on February 25, 2017. Retrieved February 24, 2017. ^ Myers, A.L. (March 6, 2008). "Three-Day Grand Canyon Flood Aims to Restore Ecosystem". Associated Press. Archived from the original on March 4, 2016. ^ Carus, Felicity (February 17, 2011). "Demand for uranium threatens Grand Canyon biodiversity". The Guardian. Archived from the original on February 26, 2017. ^ Curtis Spicer (September 24, 2015). "Arizona continues to push for new uranium mines near Grand Canyon". The Arizona Republic. Cronkite News Service. Retrieved January 7, 2016. ^ Chappell, Gordon (1985). Statements on Architectural and Historical Significance. National Park Service, Western Regional Office. ^ "Grand Canyon Desert View Watchtower". Archived from the original on February 10, 2016. ^ a b "Grand Canyon National Park Weather". April 27, 2016. Archived from the original on October 24, 2012. ^ "Flagstaff Weather Forecast Office". National Weather Service. Retrieved January 4, 2007. ^ "Grand Canyon National Park Climate Summary". Western Regional Climate Center. Archived from the original on September 2, 2012. Retrieved October 22, 2010. ^ "Grand Canyon National Park Climate Summary". Western Regional Climate Center. Archived from the original on July 26, 2010. Retrieved October 22, 2010. ^ "Grand Canyon News Release – Fire Managers Prepare to Implement Several Prescribed Fires" (PDF). March 8, 2007. Archived (PDF) from the original on May 29, 2010. Retrieved April 11, 2012. ^ "Project MOHAVE (Measurement of Haze and Visual Effects) Final Report" (PDF). Interagency Monitoring of Protected Visual Environments (IMPROVE). March 19, 1999. Archived from the original (PDF) on September 19, 2006. Retrieved April 16, 2012. ^ a b "US Annual Spatial and Seasonal Patterns of PM2.5, Light Extinction and Contributions of Major Aerosol Types, 1996 – 1998". Interagency Monitoring of Protected Visual Environments (IMPROVE). Archived from the original on August 1, 2010. Retrieved June 27, 2011. Note: Air quality as represented by PM-2.5 is shown by clicking the canyon's location on the map and selecting 'Fine Mass' from dropdown box above the map. Visibility is shown by selecting 'Deciview' from the dropdown box. ^ "Recommendations for Improving Western Vistas, Report of the Grand Canyon Visibility Transport Commission to the United States Environmental Protection Agency" (PDF). Western Regional Air Partnership. June 10, 1996. Archived (PDF) from the original on May 17, 2012. Retrieved May 17, 2012. ^ "Western Regional Air Partnership". Archived from the original on May 1, 2012. Retrieved April 19, 2012. ^ "Federal Register 40 CFR Part 51: Regional Haze Regulations and Guidelines for Best Available Retrofit Technology (BART) Determinations" (PDF). United States Environmental Protection Agency. July 6, 2005. Archived (PDF) from the original on August 26, 2014. Retrieved July 26, 2012. ^ Mike Sundblom, Arizona Department of Environmental Quality. "RA BART (Reasonably Attributable Best Available Retrofit Technology) Case Study, Navajo Generating Station, Appendix C". Western Regional Air Partnership. Archived from the original on March 31, 2012. Retrieved August 22, 2011. ^ "Revision of the Visibility FIP (Federal Implementation Plan) for Nevada (to include emissions reduction requirements for the Mohave Generating Station): Final Rule Fact Sheet" (PDF). United States Environmental Protection Agency. June 6, 2001. Archived (PDF) from the original on January 18, 2017. Retrieved July 26, 2012. ^ "Kaibab National Forest Fire Management Plan" (PDF). U.S. Forest Service. January 31, 2011. Archived (PDF) from the original on March 27, 2014. Retrieved July 30, 2012. ^ "Grand Canyon National Park Fire Management Plan". U.S. National Park Service. March 2012. Archived from the original on March 1, 2013. Retrieved July 30, 2012. ^ a b c d e f g h i j k l m n o p q This article incorporates public domain material from the National Park Service document "Grand Canyon National Park — Plants". Retrieved on October 22, 2010. ^ a b c d e f g h i j k This article incorporates public domain material from the National Park Service document "Grand Canyon National Park — Animals". Retrieved on October 22, 2010. ^ a b c d e f g h i j k l m This article incorporates public domain material from the National Park Service document "Grand Canyon National Park — Mammals". Retrieved on October 22, 2010. ^ This article incorporates public domain material from the National Park Service document "Grand Canyon National Park — Endangered Fish". Retrieved on October 22, 2010. ^ a b c This article incorporates public domain material from the National Park Service document "Grand Canyon National Park — Amphibians". Retrieved on October 22, 2010. ^ This article incorporates public domain material from the National Park Service document "Grand Canyon National Park — Crustaceans". Retrieved on October 22, 2010. ^ a b c d e This article incorporates public domain material from the National Park Service document "Grand Canyon National Park — Birds". Retrieved on October 22, 2010. ^ a b c d This article incorporates public domain material from the National Park Service document "Grand Canyon National Park — Insects, Spiders, Centipedes, Millipedes". Retrieved on October 22, 2010. ^ a b c This article incorporates public domain material from the National Park Service document "Grand Canyon National Park — Mollusks". Retrieved on October 22, 2010. ^ a b c d e f g This article incorporates public domain material from the National Park Service document "Grand Canyon National Park — Reptiles". ^ "Executive Summary of Grand Canyon Tourism" (PDF). Northern Arizona University. Archived from the original (PDF) on September 28, 2010. Retrieved January 4, 2007. ^ "Operating Hours & Seasons – Grand Canyon National Park". Archived from the original on March 3, 2011. ^ a b "Backcountry Permit". Grand Canyon National Park. Archived from the original on December 18, 2010. Retrieved October 22, 2010. ^ "Skywalk". Grand Canyon National Park. Archived from the original on March 8, 2013. Retrieved March 19, 2013. ^ Adam Nagourney (December 3, 2014). "Where 2 Rivers Meet, Visions for Grand Canyon Clash". New York Times. Archived from the original on April 3, 2015. Retrieved March 5, 2015. ^ Chiara Sottile; Kristen Dahlgren (February 8, 2015). "Grand Canyon Development Plan Sparks Dispute Among Navajo". NBC News. Archived from the original on March 6, 2015. Retrieved March 5, 2015. ^ The Active Times (August 9, 2016). "How Many People Die in the Grand Canyon and is it Becoming Too Dangerous?". Archived from the original on February 19, 2017. ^ Citylab (May 26, 2015). "This Grim Map Shows How People Have Died at the Grand Canyon". Archived from the original on August 20, 2017. ^ Ghiglieri, Michael P.; Myers, Thomas M. (2001). Over the Edge: Death in Grand Canyon. Puma Press. ISBN 978-0-9700973-1-6. Public domain images at the Wayback Machine (archived August 30, 2010) from the National Park Service. Grand Canyon Bibliography – bibliography of the Grand Canyon. 37,462 items produced between 1540 and the present. Grand Canyon Explorer: History timeline from 10,000 years ago to 1994. 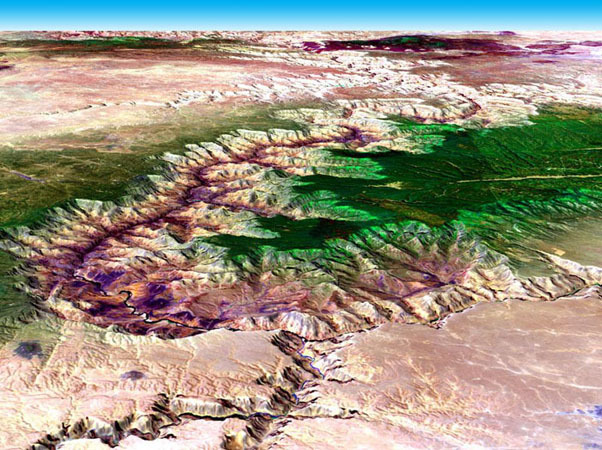 Grand Canyon 3-D perspective – view looking southwesterly, showing North Rim and Canyon. This page is based on the Wikipedia article Grand Canyon; it is used under the Creative Commons Attribution-ShareAlike 3.0 Unported License (CC-BY-SA). You may redistribute it, verbatim or modified, providing that you comply with the terms of the CC-BY-SA.